I’ve never used stencils to create a design on a pumpkin before, but after I watched a friend do it the other day while my freehand pumpkin came out looking like crap, I realized it was worth the time and effort, and wasn’t too difficult. I searched all over last night for good designs and I have to say Zombie Pumpkins wins hands down on stencil design quality. There’s a paypal access thing (you can pay whatever you feel like from $2 on up for unlimited access for this halloween season) but after I chipped in a fiver, I got a password and could print anything I wanted. The site also has loads of helpful tips. I can’t say enough good things about Zombie Pumpkins. They have loads of cool designs and they’re easy enough to follow that anyone could do them. 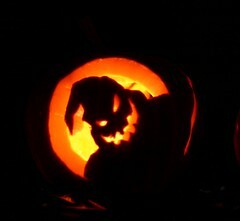 Heh, we did Oogie-Boogie and Zero from the same site. 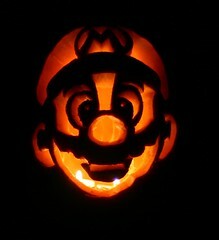 Looks a lot like the pumpkin I carved last year. Nice job. I tried a bush-o-lantern from a stencil I found on the web, but there was so much negative space that the bits of face that were left just sort of shriveled and up and looked terrible really quickly. I carved Saturday night, and the next day it was already going; by Tuesday night it was so unrecognizable that I turned it around and put a more standard jack-o-lantern face on the other side in between trick-or-treaters. Next year I’ll have to try for something that’ll maintain its integrity longer. I love Zombie Pumpkins patterns !